Library of America, 9781598535389, 1100pp. The star-spanning story of humanity’s colonization of other planets, Ursula K. Le Guin’s visionary Hainish novels and stories redrew the map of modern science fiction, making it a rich field for literary explorations of “the nature of human nature,” as Margaret Atwood has described Le Guin’s subject. Now, for the first time, the complete Hainish novels and stories are collected in a definitive two-volume Library of America edition, with new introductions by the author. 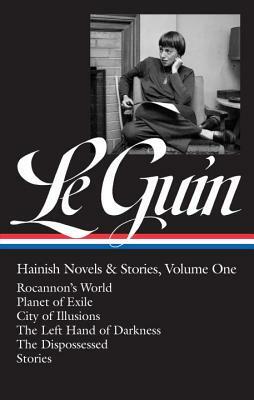 This first volume in a definitive two-volume edition gathers the first five Hainish novels: Rocannon’s World, in which an ethnologist sent to a bronze-age planet must help defeat an intergalactic enemy; Planet of Exile, the story of human colonists stranded on a planet that is slowly killing them; City of Illusions, which finds a future Earth ruled by the mysterious Shing; and the Hugo and Nebula Award-winning masterpieces The Left Hand of Darkness and The Dispossessed—as well as four short stories. Ursula K. Le Guin is one of the most celebrated writers of her generation, recipient of multiple Hugo, Nebula, Locus, and World Fantasy Awards. In 2014, she was awarded the National Book Foundation Medal for Distinguished Contribution to American Letters.